Assembly systems for battery mounting by Emil Schmid Maschinenbau are customized special machines for battery units of electric vehicles. They consist of two sub-units; the assembly of individual cells into cell blocks and the assembly of cell blocks into the battery. Application-specific, between 12 and 24 individual cells are assembled to cell blocks. Depending on the required range, the finished battery units consist of 6 to 64 such cell blocks. While the cell block assembly is mostly highly automated, many manual operations are characteristic of the battery assembly. Typical voltage ranges are 600 volts. Assembly systems for battery mounting are used for the construction of drive batteries for electric vehicles. For example, individual pouch cells, frames and aluminum profiles are stacked into cell blocks, which then - together with the sheet metal tray and insulation - are being installed to form batteries. 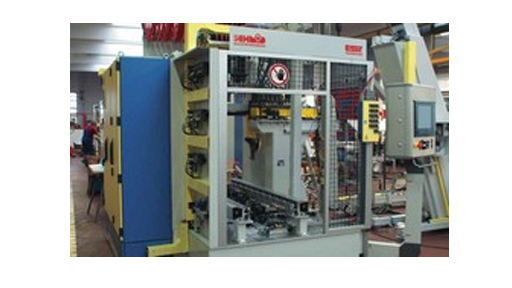 The assembly systems for batteries are supplied by Emil Schmid Maschinenbau as turnkey customer-specific systems. These are based on a workpiece carrier transfer system with free circulation and are realized with modular components as far as possible with the desired degree of automation. Users are the automotive and automotive supply industries as well as the electrical industry.